We’d love your help. Let us know what’s wrong with this preview of A Movie in My Pillow/Una pelicula en mi almohada by Jorge Argueta. To ask other readers questions about A Movie in My Pillow/Una pelicula en mi almohada, please sign up. Response: This wonderful book of poems captures the author's memories of his childhood in El Salvador in such a way that when I finished the book, I felt like had met the author. The format has the poem in Spanish and then in English, sometimes on facing pages, sometimes alongside each other. The sadness of his abrupt departure from his home is tempered by the joy he finds in his new surroundings in San Francisco and by his sense of humor. I laughed out loud at some of the thoughts and expressions, so characteristic of 8-10 year old boys. I'd love to add some quotes (I just typed them in and deleted them), but the poems are really at their best if read them yourself. A good picture book with colorful illustrations. Tells the story of Jorgito who comes to live in San Francisco by way of El Salvador.As I read the poems of this book I couldn't help but notice Jorgito's constant comparisons of the things in San Francisco to his native country El Salvador. I guess he really missed home. But for everything he encountered in his new home he found some kind of way to connect it to his homeland. Take a look at Papa's Voice (page 15), My Bicycle (page 16) or Playful T A good picture book with colorful illustrations. Tells the story of Jorgito who comes to live in San Francisco by way of El Salvador.As I read the poems of this book I couldn't help but notice Jorgito's constant comparisons of the things in San Francisco to his native country El Salvador. I guess he really missed home. But for everything he encountered in his new home he found some kind of way to connect it to his homeland. Take a look at Papa's Voice (page 15), My Bicycle (page 16) or Playful Tomas (page 22) and you should see what I mean. I could see this book going over well in a classroom where there are migrant children who have been relocated from their homeland. I think being able to write about the present and connect it to the past would make them feel comfortable. A creative compilation of the author’s childhood memories. Great book! I would love to read this one to my students! Really let’s you use your imagination. "A Movie in My Pillow" by Jorge Argueta was an absolute thrill to read; I think that out of all the books I found, it was my favorite. Through its beautiful poems, it gracefully captures the feelings of the little boy who is learning to adjust to a new life in the Untied States. The story was quite appealing as it is formatted into several small poems about Jorge and his father leaving El Salvador for a new life in San Francisco. The poems range from Jorge's dismay at having to leave the home he "A Movie in My Pillow" by Jorge Argueta was an absolute thrill to read; I think that out of all the books I found, it was my favorite. Through its beautiful poems, it gracefully captures the feelings of the little boy who is learning to adjust to a new life in the Untied States. The story was quite appealing as it is formatted into several small poems about Jorge and his father leaving El Salvador for a new life in San Francisco. The poems range from Jorge's dismay at having to leave the home he knows to his happy adjustments in his new home. The poems were rhythmic, easy to understand, and convey to a reader of any age what Jorge is going through. The illustrations were colorful and easy to understand; definitely something that would hold young children's interests. As each poem changed, the illustration would match it, which would make a great discussion with children who are perhaps having a hard time understanding the words. In terms of culture, "A Movie in My Pillow" is exactly what I was looking for. A story of Latino immigrants, it beautifully shows how impactful a life choice like that can have on a child. It is also a life choice I can relate to, coming from Latino immigrant parents. 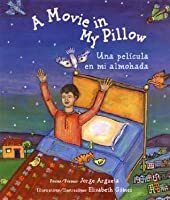 "A Movie in My Pillow" is a great book to read to young children because it presents marginalized people and sheds an educational light on their experiences. That can be helpful not only with children who are unfamiliar with that plight, but also with children who come from that exact background and would benefit from representation. This is a book of poetry vignettes written by Jorge Argueta, a native of El Salvador, who moved with his father to San Francisco. The poems are written in language that is age appropriate for 3-5th graders. In his poems, location, family, traditions, and migration are major themes. He describes the traditional foods such as Pupusas, and describes the discernible differences between San Francisco and his city of San Salvador. He describes the feelings of loneliness and regret as he boarded the bus with his father, having said goodbye to his mother and abuelita. Personal reaction: The illustrations of this book are also striking. The flow perfectly with his prose, depicting subtle nuances in his facial expressions that tell the truth of what it means to uproot yourself from your home. Recommend? I cannot say enough how much Jorge is able to write in such an admirable, lucid way I can taste, smell, hear, and see his home country. His writing is inspiring for anyone who feels they have been displaced from their home, whether by their choice or not. The vivid way in which he describes the parakeets, the sun, his grandmother's native Nahuatl tongue all paint a picture of what life was for him in El Salvador. This is the second book that I have read from this author and I like it just as much as I did the last one I read. The author writes this book completely in poetry. Each poem is short and in English but is coupled with the Spanish counterpart on each page, usually beside or underneath the English. The words are as bold as the colorful pictures. All this describes his thoughts of being a young boy pulled suddenly from his home land of El Salvador. Only he and his Father came to the United States leaving behind his Mother, Grandmother, and younger siblings. His "movie" was really his dreams of those things that he left behind. Eventually, the rest of his family joins him and he gets to show them his new life. At first the only thing that confused me was the connection of the "movie" and the entire book. This might confuse children as well. As I mention above, I eventually did get the connection. At the bottom of some pages there were explanations for some words that did not translate into English. This was ok but in very tiny print and at times, hard to find. I think I would have liked to have seen those in the back of the book in the same bold font as used with the rest of the book. I would recommend this book for bilingual children and families as well as people who want to learn either language. Overall though, this book still gets 5 stars from me. 1. Culture or group portrayed: Latin-Americans. 2. Summary: Young Jorge comes to the United States from El Salvador, which is in the midst of civil war. He and his father settle in the Mission Hills district of San Francisco; his mother and brothers are able to come later. In English and Spanish, the author’s poetry speaks of being a child straddling two cultures, the one in which he was born and the one in which he lives. 3. Cultural/Multicultural evaluation: A Movie in my Pillow is a dual-langua 1. Culture or group portrayed: Latin-Americans. 3. Cultural/Multicultural evaluation: A Movie in my Pillow is a dual-language book; each poem is in English and Spanish. The illustrations are done by Elizabeth Gomez, who is also Latin-American (she was born in Mexico City); they evoke a colorful neighborhood in California. Mr. Argueta’s poems show the differences between his new culture and his home culture – one poem speaks of mangoes in cans, when he used to just pick them from trees; chickens are wrapped in plastic here, where he used to sleep next to them in El Salvador. Some of the poems are also about being a kid – his bike, a yo-yo, and even an amusing one about his friend telling him how birds actually fly. The author uses some words that may be unfamiliar to readers, such as papusas, but they are explained in little footnotes at the bottom. A Movie in My Pillow is a collection of poems about a boy named Jorgito who moved from El Salvador to the Mission District of San Francisco. In each of his poems he tells how he felt or what he wanted to feel during these hard times.The author, Jorge Argueta and his family had to move from El Salvador to the U.S. because of the Civil War. He dedicates this book to all of the children from El Salvador. Within each of these poems is a description of what he saw, lived, and his dreams. He writes ab A Movie in My Pillow is a collection of poems about a boy named Jorgito who moved from El Salvador to the Mission District of San Francisco. In each of his poems he tells how he felt or what he wanted to feel during these hard times.The author, Jorge Argueta and his family had to move from El Salvador to the U.S. because of the Civil War. He dedicates this book to all of the children from El Salvador. Within each of these poems is a description of what he saw, lived, and his dreams. He writes about his neighborhood, San Francisco, Popusas, When his family left El Salvador, and tells the stories of his Grandmother and Uncle. It is a very touching story and I would read this to a 4th or 5th grade classroom during a read aloud. It is a developmentally appropriate book for elementary school children. This story is about a boy named Jorge and his journey from El Salvador to the United States. Throughout the poems, in this book he recalls different memories from his home in El Salvador. Jorge describes what his father and he learned while being in America. In the poems, you can see the difference between his new culture and his home culture. I really enjoyed this book and like how the poems were in English and Spanish. This book relates to my topic because it gives a child's perspective on his This story is about a boy named Jorge and his journey from El Salvador to the United States. Throughout the poems, in this book he recalls different memories from his home in El Salvador. Jorge describes what his father and he learned while being in America. In the poems, you can see the difference between his new culture and his home culture. I really enjoyed this book and like how the poems were in English and Spanish. This book relates to my topic because it gives a child's perspective on his transition from one culture to a new one. Many immigrant children can relate to this because every culture is different and adjusting to a new one can be hard. No leí este libro por el argumento, sino para practicar mi Español. Aunque no me interesó mucho el argumento, no me puedo quejar porque el libro me ayudó tanto mejorar la lectura. Definitivamente, recomendaría este libro a cualquier principiante que quisiera practicar su Inglés o Español. I didn't read this book because of it's plot, but rather, to practice my Spanish. Even though I didn't find the plot that interesting, I can't complain because the book helped me better my reading comprehension. No leí este libro por el argumento, sino para practicar mi Español. Aunque no me interesó mucho el argumento, no me puedo quejar porque el libro me ayudó tanto mejorar la lectura. Definitivamente, recomendaría este libro a cualquier principiante que quisiera practicar su Inglés o Español. I didn't read this book because of it's plot, but rather, to practice my Spanish. Even though I didn't find the plot that interesting, I can't complain because the book helped me better my reading comprehension. I would definitely recommend this book to any beginner who wants to practice their English or Spanish. Jorge Argueta writes beautifully in this book a poems. A Movie in My Pillow is intended for readers in grades 4-8. In this collection of poems, each poem is written in both English and Spanish alternating between which is presented first on the page. Young Jorge and his father leave their home in El Salvador and move to the Mission District in San Francisco. The poems touch on Jorge's move, his family that he misses back home, simple things in life like a bike and truck, and friendships. Although Jorge loves his new home in San Francisco, he will never forget his old home in El Salvador. This is a book of short poems that tell the tales of a young boy's transition from El Salvador to San Francisco. His poems tell stories inspired by family. They are filled with his longing for the land he misses as well as his journey through childhood in a new city that becomes his home. This book won an Amercas Award for Latin American Literature. It is appropriate for all grade levels, especially primary. The illustrator does an excellent job capturing the essence of each poem. This is a book of short poems that tell the tales of a young boy during his transition from El Salvador to San Francisco. His poems tell stories that are inspired by his family as well as his homeland. They are filled with his longing for the land he misses as well as his journey through childhood in a new city that becomes his home. Great for a short read aloud in your classroom. A teacher could read a poem at the end of the day for students. 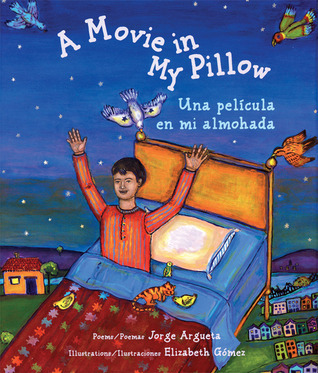 The book A Movie in My Pillow by Jorge Argueta is a book of poems, which are written in both English and Spanish. The book describes the experiences of a boy from El Salvador. The book can be used for bilingual students who speak and read both English and Spanish. This book can be used in Kindergarten-5 grade classrooms. Using this book with ELLs will be very benefitual. As a boy Argueta and his father left war-torn El Salvador for San Francisco. These moving poems are drawn from his own childhood experiences. At night when he dreams, he remembers his homeland -- "as a movie in my pillow." Very little written about El Salvador. Excellent, authentic source and voice. This book is a set of short poems that tell the story of a boy who immigrates from El Salvador to America. It is written in both English and Spanish. This book could be used to describe the differences as well as the similarities between the Hispanic culture and the American culture. it could be used to talk about different families and customs. It could be read to students in grades K-5. This book is about a young boy's adventures as he came from El Salvador to the United States. There are poems in Spanish and English, and this book would be great in an ELL class, a Spanish class, or during a Multicultural unit. This book is appropriate for students grades 3-8. The pictures in this book are very vibrant and lively, and this is a book that sutdents will enjoy. This book of poetry has absolutely beautiful language. I used "Barrio lleno de Sol" for my 7th grade Spanish class since we started a unit on cities and neighborhoods. This book is full of beautiful poems. This book is not only educational, but truely enjoyable. I love the poetryin both languages enjoying the lack of rhyme in both. it is also fun to learn about El Salvador. Illustrations are a delight. I also read Arroz con Leche, but it doesn't seem to be in goodreads. A bilingual children's book that is a compilation of poems from Jorge Argueta's life. He came from El Salvador to San Francisco at a young age and several of the poems touch upon this experience. Some are serious memories of relatives and then there are some silly and fun, like one about a yoyo. Poems in both Spanish and English about a young boys immigration from El Salvador to the United States with his father.